← Clotted Cream and Hot Apple Toddys. You Win UK. I’d done some research before I arrived and there were a couple of things I wanted to do in Edinburgh that were absolutes for me. One was visiting the Holyrood Palace and the other was being in Edinburgh Castle at the precise time to meet Mary, Queen of Scots. Both items were on my agenda for Christmas Eve. Amanda texted me to let me know they had some errands to run and might meet up with me in the afternoon at the castle, so I took off on my own. The route to the Palace was fairly simple from my hotel. 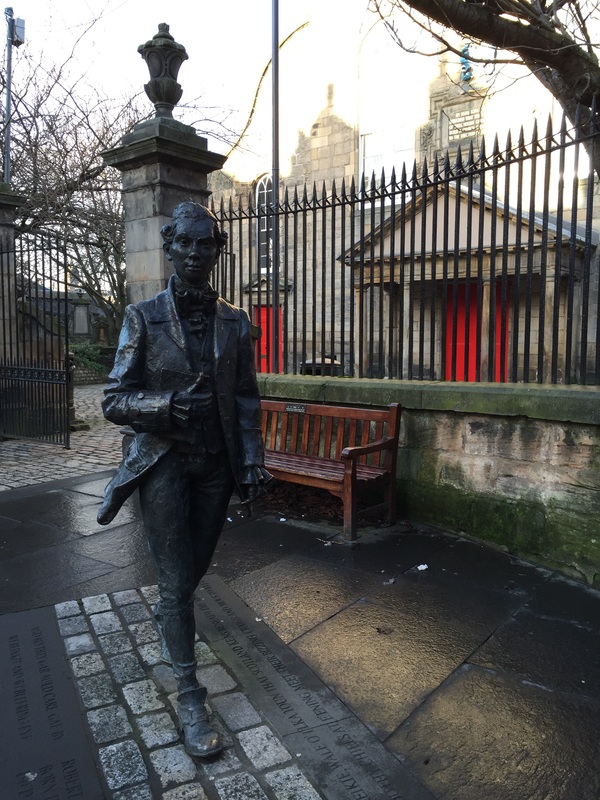 A short walk through Grassmarket and then up the Royal Mile. I somehow skipped the whole Grassmarket part and ended up at the top of the Royal Mile, just outside the castle gates. 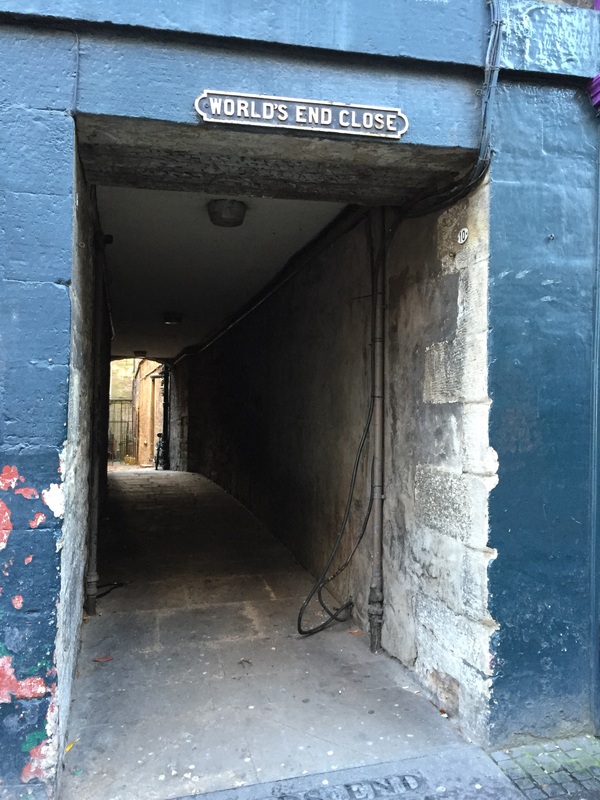 There weren’t many people about so I strolled down the street snapping pictures of interesting sites like World’s End Close.. The end of the world is right here! And the really interesting exterior of the Scottish Parliament. 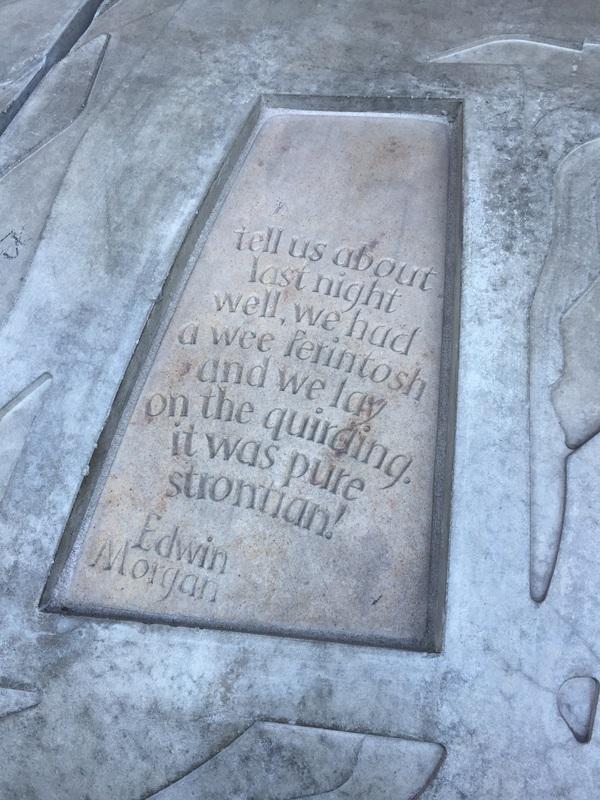 It’s surrounded by a wall covered with great Scottish quotes. I found my way to the Palace, which wasn’t hard since it’s pretty much the end of the road. Loved the doors. The kind of door I dream about. And the magnificent entry way. My condo association should look into constructing one of these to impress our visitors. Unfortunately, they don’t let you take pictures of the interior. It’s a shame too because I would have liked a picture of the thrones all done up in red velvet and gold thread. Have I told you I need more gold in my life? 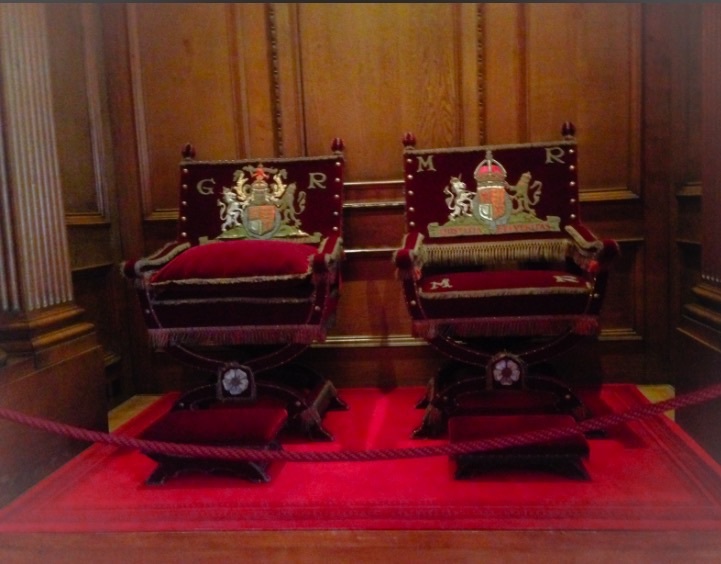 The thrones were beautiful and I love that the queen’s throne has a sort of booster seat in the form of an extra cushion, although if I were queen it would have to b at least… three times as big! I did manage to capture an image from the web for your viewing pleasure. Queen gets an extra cushion, of course! I saw the King’s bedchamber. The bed was really impressive. What was even more impressive was that it wasn’t his actual bedroom. Apparently he only laid in the bed when he had important meetings and really wanted to impress people with his splendor. He slept in a much smaller bed in some room that was not a part of the tour. I imagine its pretty spartan if they still don’t want us taking a peek! 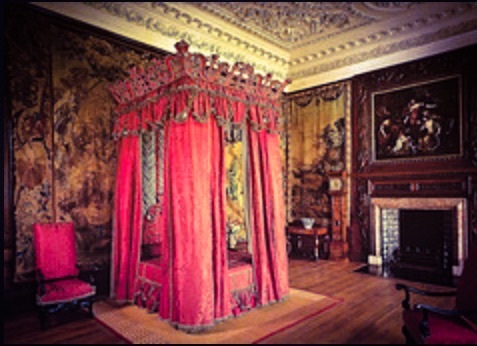 I need a bedchamber where I can lay in bed and impress my most important visitors. 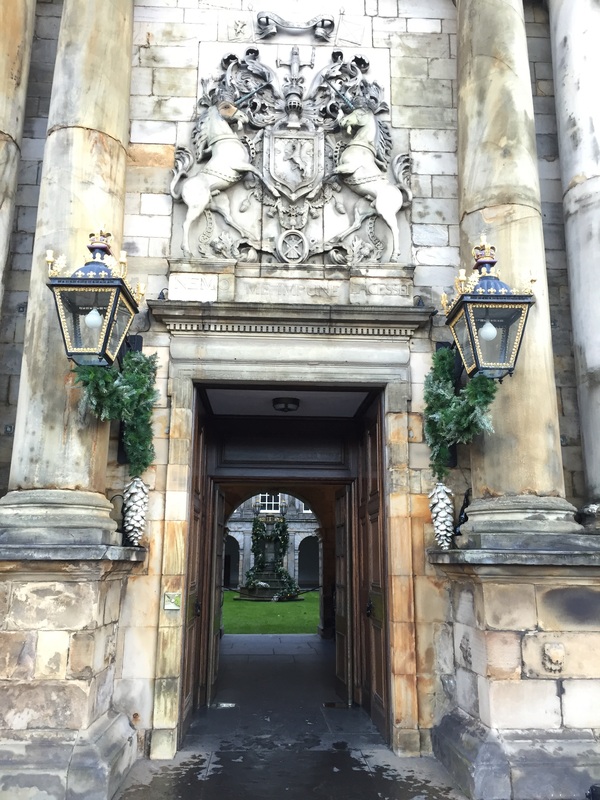 The tour included a trip through Mary Queen of Scots apartments. There was a harrowing spiral staircase that went from her state bedroom to her actual bedroom. Adjacent to the bedroom was her dining room. The dining room was literally only about twice as big as my walk in closet. There’s no way anyone is eating in my closet, though to be fair and given my “shopping problem”, maybe they could if I were to move out? Anyhow, the tiny dining room was significant because that’s where Mary, her ladies in waiting and her Italian secretary David Rizio were chilling when her husband, the jealous Lord Darnley, and a bunch of his posse showed up and dragged him out to Mary’s bedchamber where they stabbed him 56 times while Mary and her ladies looked on. Apparently she fled the palace for the castle, which was only a mile up the road. A year later her husband died mysteriously and she abdicated for her infant son, fled to England and imprisoned by her cousin Queen Elizabeth I. It’s no wonder she’s a bit paranoid! 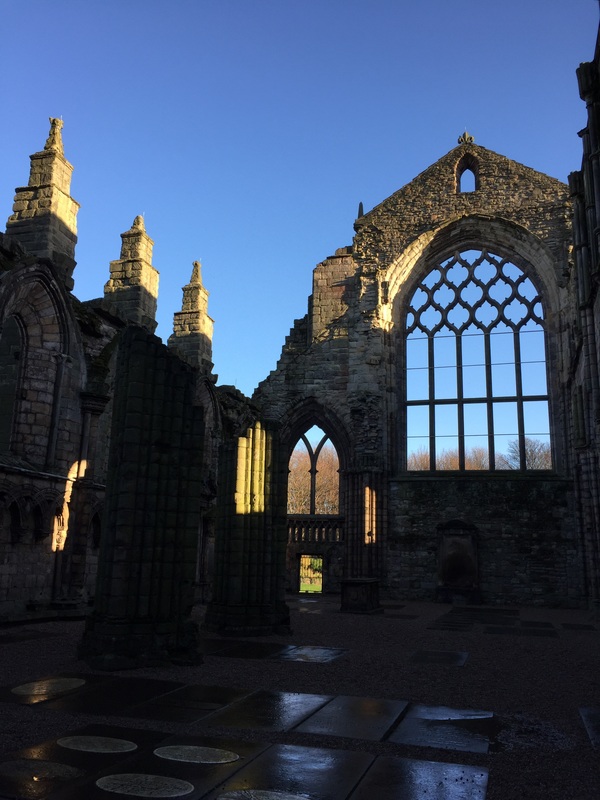 at the back of the palace are the remains of the Holyrood Abbey. How convenient to have your Abbey right outside your back door. I decided to walk back to the hotel and check in with Amanda. 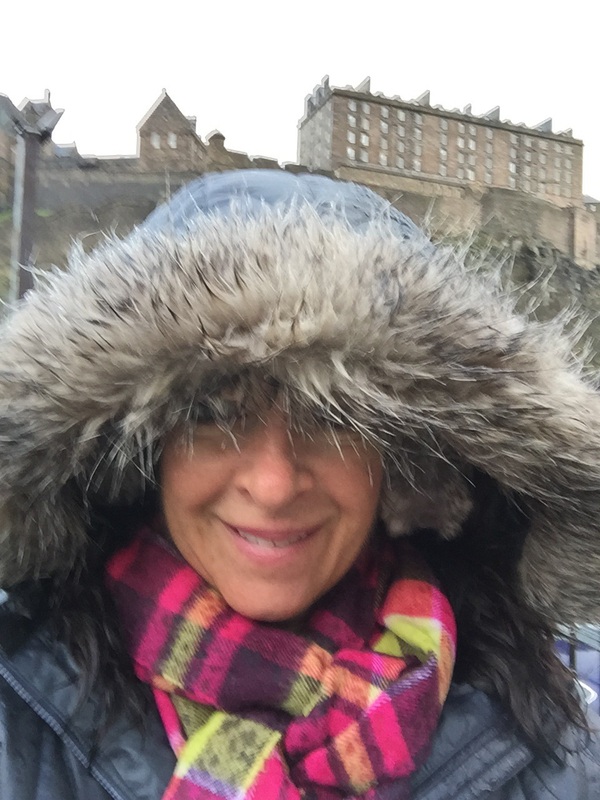 As I made my way back up the Royal Mile it began to sprinkle. The sky wasn’t terribly overcast so I just kept going. As I topped the hill where the castle sits, the downpour began, along with the gale force winds. Since I was walking down the hill into the wind, I struggled to keep my hood up and my earmuffs kept sliding forward every time I put it back on. I had to hold onto them and by the time I arrived at the hotel I was soaking wet, though mostly on the front. 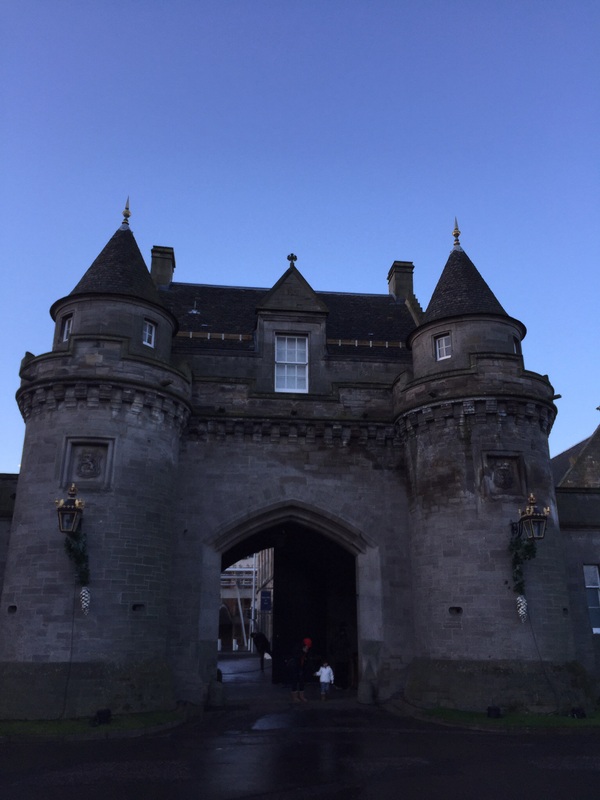 This entry was posted in Getting Around, Life Story and tagged Bedchamber, Christmas, Edinburgh, holiday, Holyrood Palace, Mary Queen of Scots, Scotland, Scottish Paliment, vacation, world's end. Bookmark the permalink. Haha, if i have time tomorrow I’m crown shopping. I’ll see if they have Daisy or Peanut sizes!